Preheat oven to 350° F . Bake coconut in a single layer on a baking sheet 8 to 10 minutes or until toasted. Bring broth, next 2 ingredients, 2 tablespoons butter, and 1 cup water to a boil in a 2-quart saucepan. Stir in rice. Cover, reduce heat to low, and cook 15 to 20 minutes or until rice is tender and water is absorbed. Meanwhile, melt remaining 1 tablespoon butter in a medium saucepan over medium-high heat; add onion and poblano pepper, and sauté 5 minutes or until tender. Stir in black beans, chili powder, cumin, and 3/4 cup water. Cook over medium-low heat, stirring occasionally, 15 minutes. Grate zest from lime, avoiding pale bitter pith, into a bowl; squeeze juice from lime into bowl. Fluff rice with a fork. Fold lime zest and juice, coconut, green onions, and cilantro into hot cooked rice. 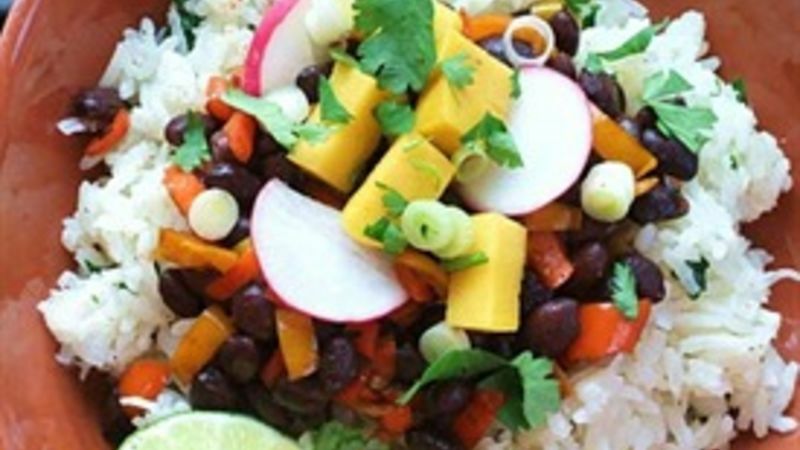 Serve bean mixture over rice with desired toppings.